Yay! 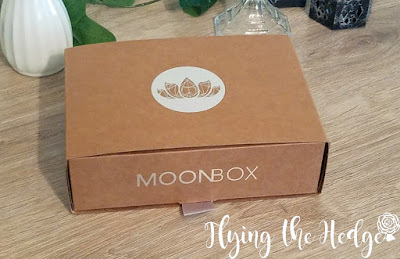 Another Moon Box review! 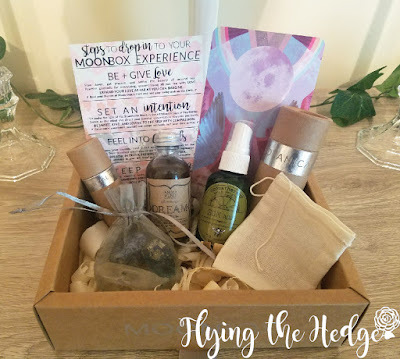 I cannot express how much I am loving this monthly box! 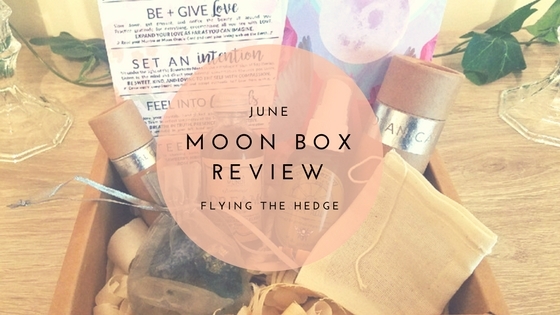 Thus far, it has been my favorite subscription box, so much so I think I am going to continue my subscription, but stop reviewing it each month....unless you guys just want to read them. If so, please let me know in the comments. This little box was waiting for me when I returned from my trip to Florida. Ah yes...I went to the beach with a friend from college for several days. It was AH-mazing! Wish I was still there! Anyway, back to the Moon Box. As always, I was greeted with an envelope asking me to find somewhere quiet to open the box and explore the contents. 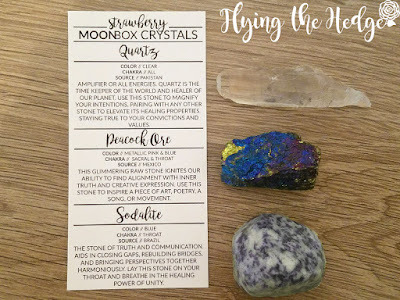 Inside the envelope were the information card, June's Strawberry Moon Oracle card, and the informational card on the crystals contained in the box. I really enjoy the Oracle cards each month, which explain the energies of the full moon for the month and contain some beautiful artwork. 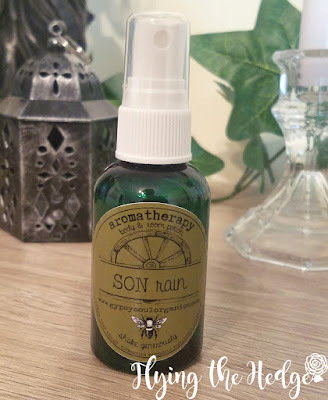 Underneath, the first item to catch my eye was the bottle of aromatherapy spray "Son Rain" by Gypsy Soul Organics. It contains cedar leaf, violet, citronella, patchouli, eucalyptus, and galbanum. 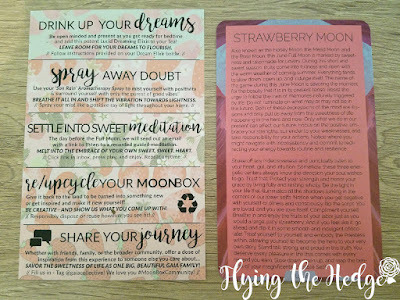 According to the information card, this aromatherapy spray is designed to remove doubt and fill you with positivity and good vibes. I can honestly say it works. I received some bad news at the doctor this week and this little spray has made me feel better when I notice I am starting to feel depressed. I have used it on myself, in rooms, and even on my bedding and pillows. The violet aroma induces self-love, while the cedar leaf, eucalyptus, and citronella bring healing energy. The galbanum, a very subtle earthy scent, works to help ground and purify. With each spray, I feel more confident that things will be okay and that, despite what is going on in my body, I will get through this. 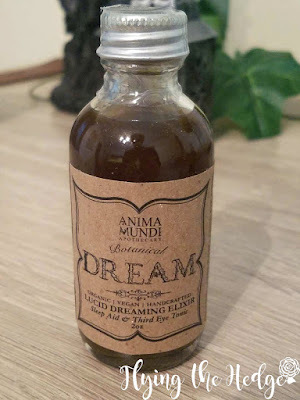 The next item to catch my eye was the lucid dreaming elixir by Anima Mundi Apothecary. According to the bottle, it is a handcrafted, organic, and vegan lucid dreaming elixir, sleep aid, and third eye tonic. Due to my illness, I have not tried this product yet, but I am very excited to. At this time I am concerned it may interfere with my medication, and because I am ill, it is not wise to try any lucid dreaming or astral projection at this time. 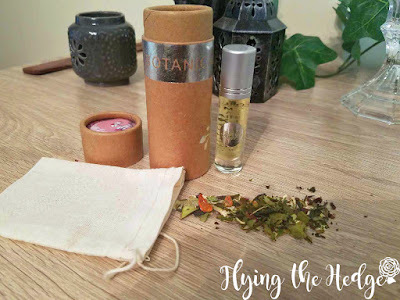 This elixir, however, contains Ashwagandha, Kava Kava, and Passionflower, which are all stress relievers and relaxers, Skullcap, which increases dreaming, and Blue Lotus, which has psychoactive properties that aid in inducing lucid dreaming, astral projection, and hedge riding. When I am able to test this product, I will be sure to write a separate, detailed post on my experience. I would like to test this for a full week to give everyone a good idea of how well the product works. Next was the tea and essential oil. Fruits of the Roots put together a stunning tea blend of strawberry, hibiscus, white tea, vanilla, rose hips, and nettle leaf. 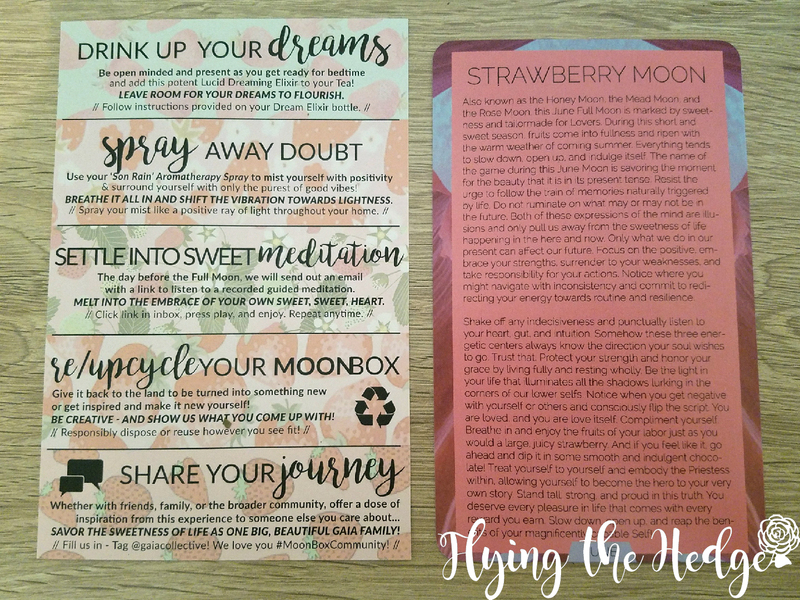 This tea is very sweet and fruity, making it a wonderful addition to this month's Strawberry Moon. The Moon Essential Oil, blended by Cottage Traditions, contains Clary sage, violet leaf, white sage, lime, blood orange, and lavender. It goes well with the aromatherapy spray. And finally the crystals! This is one of my favorite things each month. This month's contained a quartz point from Pakistan, Peacock Ore from Mexico, and a large Sodalite crystal from Brazil. Quartz is an amplifier of energy and can be used for just about everything. 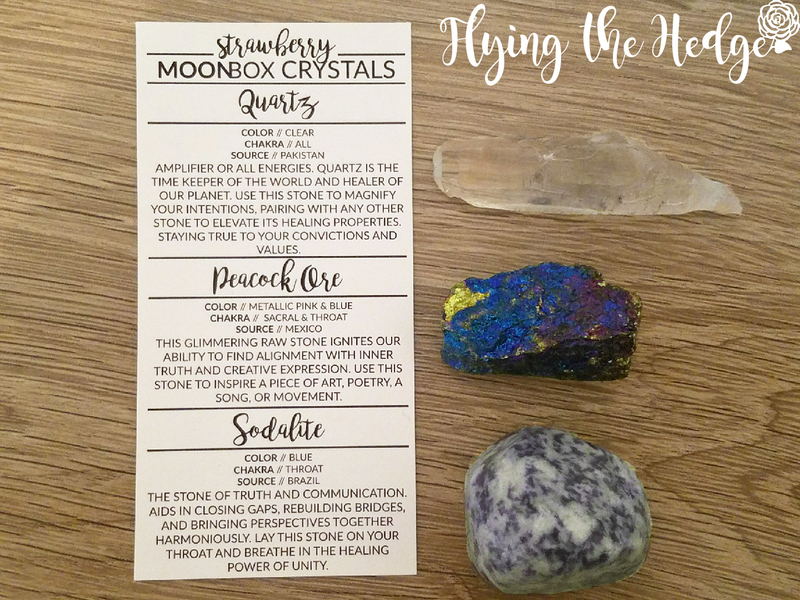 It works well with other crystals to amplify their energy, making it a great crystal for the Strawberry Moon when you set new goals and intentions. The Peacock Ore is truly stunning. It is brilliant blue and gold with hues of deep plum purple. This crystal ignites creative expression. I will be using it from now on while I work on my grimoire. Sodalite is used to bring things together and in unity spells. This crystal will be great for marriage work. 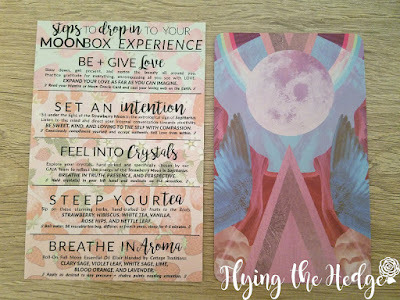 The day before the full moon, Gaia Collective sent out an email with the full moon meditation. This month's guided meditation focused on embracing your heart, setting new intentions, and filling your life with joy and beauty. These guided meditations are wonderful and excellent for anyone unsure of what to do during the full moon. Since it has been three months, I would like to give you a complete break down of my overall thoughts on this box. The box is consistent. 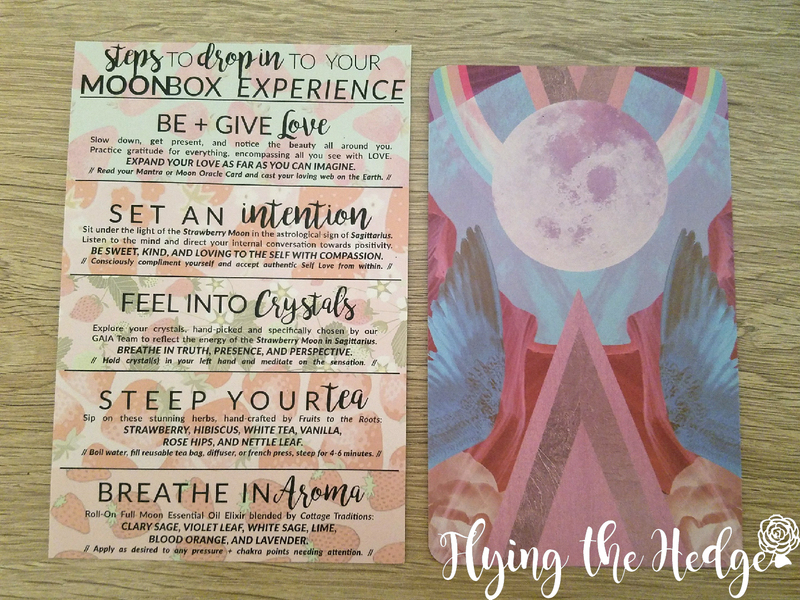 It always comes with an information card, moon oracle card, crystals, tea, essential oils, full moon guided meditation, and other monthly self-care items centered around the full moon. The item quality is great. Every item is worth more than I paid. The information card is fantastic. It explains where the items came from and how to use them in your monthly full moon ritual. The crystal information card is great. In fact, I cut them out and place the cards in with the crystals so I always have them for reference. Gaia Collective supports local businesses and for every box sold, a portion goes to Trees for the Future, a nonprofit organization dedicated to revitalizing degraded lands through educational programs for farmers and planting trees to create new forests around the world. The box and packing supplies are environmentally friendly, so when you are done, it can be reused, recycled, or returned to the earth. This box is available! There is no waiting list! While I loved the consistency, I do not need essential oil every month. I would have liked to see the essential oil replaced with another item occasionally. Interested in purchasing this box? Check out Cratejoy. 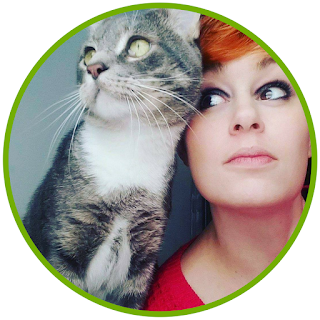 They have a large selection of subscription boxes that cover just about everything.